James was one of thirteen children born to James and Elizabeth Batey, a well known Longtown family who had a gamedealer’s business at 37 English Street for many years. The Batey family had farmed in the area for at least eight generations! James’s mother was Elizabeth Newby before she married. His father died in 1931 and his mother in 1945. After James left school he joined the family business in Longtown. On enlistment he described himself as a fishmonger. He was a gymnast and played centre forward in the football team. The end of season report described him as “a useful player, unselfish and fast” he scored seven goals during the season. Two of James’s brothers also attended CGS. 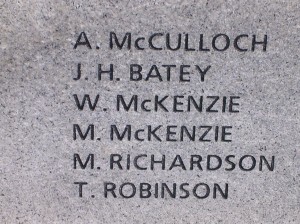 He is also commemorated on Longtown War Memorial and on his parents’ headstone in Arthuret Churchyard, Longtown. James’s brother John survived WW1 but was an invalid for the rest of his life. 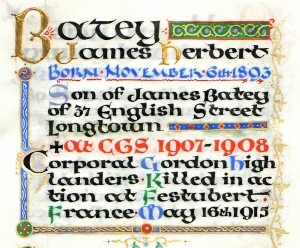 His son John Keith Batey also attended Carlisle grammar school. He was a gifted mathematician and he won a scholarship to Trinity College, Cambridge. In WW2 he was recruited to work at Bletchley Park, and he was one of the team who cracked the codes on the enigma machines. After the war he had a distinguished career in the foreign office and civil service.